There are now at least four nests with chicks at the Viera Wetlands. I believe this chick is the oldest of the group. The chick is approximately 1 1/2 to 2 weeks old. This is the second oldest chick, just a few days younger than the chick in the first photo. 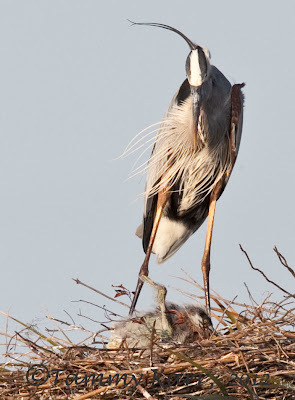 The Great Blue Heron mom seemed a bit more relaxed today. Two chicks were spotted in this nest on Sunday, but I only saw one on this occasion. Or maybe she was just completely exhausted. 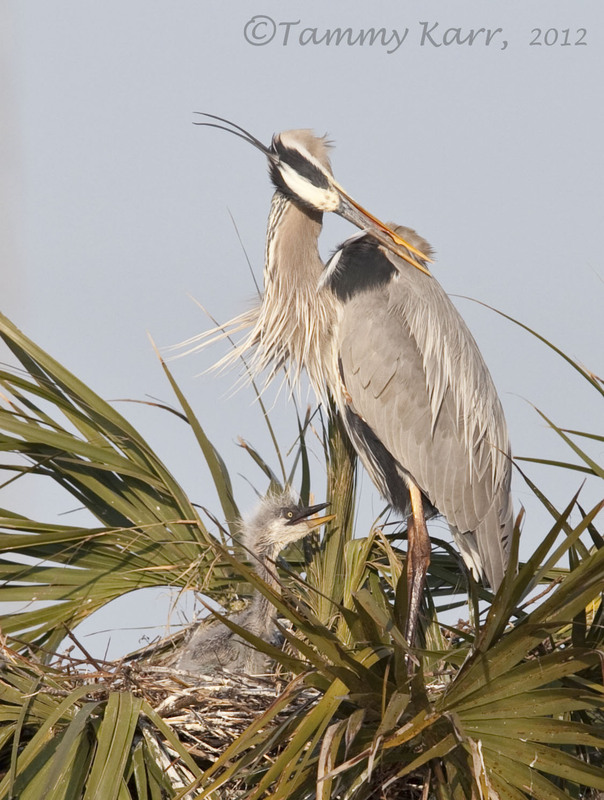 This is the most recent nest to have hatchlings. There are three chicks in this nest. The third chick lifted its head twice, but appeared very weak. It's hard to believe a Great Blue Heron's wings are ever this tiny! The chicks in the fourth nest were not visible as they were resting. I wish i could be there.....lovely photo's Tammy. Thank you Joop,I hope you have a lovely weekend also! 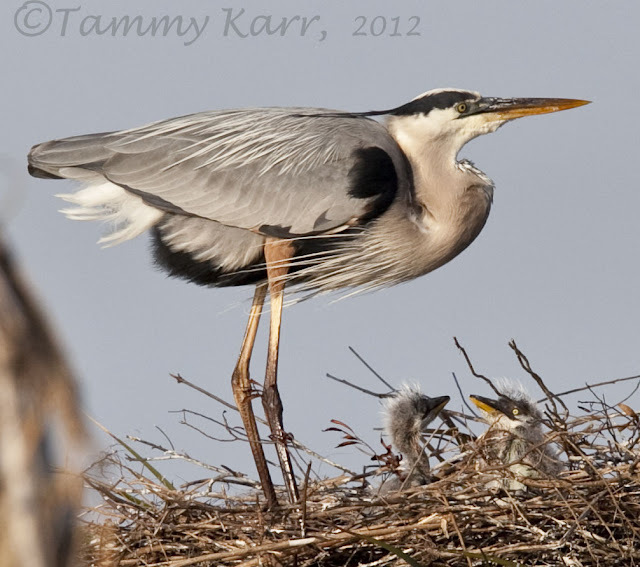 I'm really enjoying your nesting Great Blue photos Tammy! How absolutely marvellous - what a wonderful thing to be able to witness - I'm jealous! Superb quality of photographs as usual, my favourite is the third one. Thank you Christian! it is fascinating to observe! 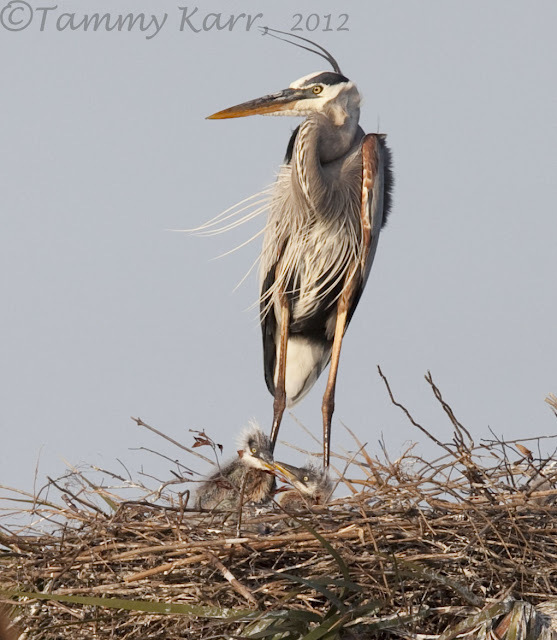 I've never seen a GB Heron chick, thanks to this post now I see just how cute they are! Thanks for checking them out Lauren! Great photos Tammy, a pleasure to see. Great series of photographs. 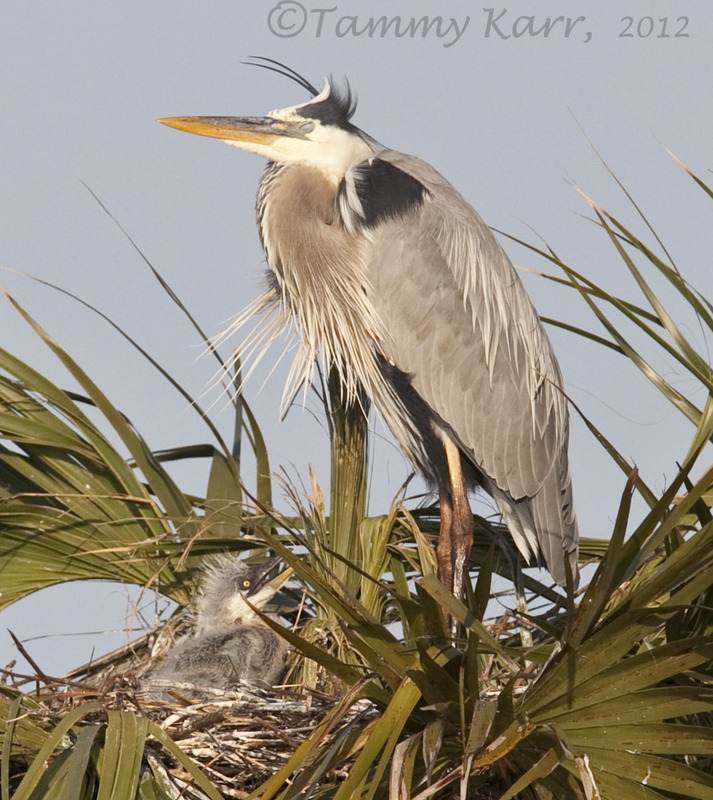 The leaves are the same shapes as the heron's bills. Love to see the Blue Heron and the chicks! Thanks for your comments! I hope you have a great weekend also! 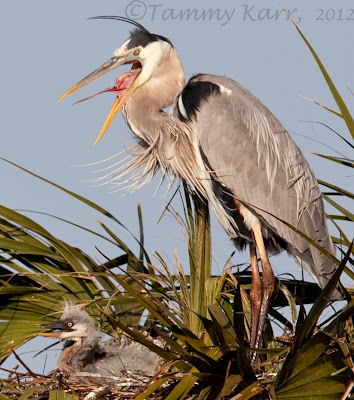 They are so vulnerable; it's especially nerve-wrecking when they get bigger and are moving all around the nest, but can't fly, as their nest is built over water. So, you are responsible for the filming, it is superb. The chick keeps looking at the mother, at least I think it might be mother, lovely. Tell me, how do you get up high enough to watch it? Bob, these photos are from the from the road. The birds nest in a cluster of palms out in the lake. The trees are close to the heavily traveled road, so visitors to the wetlands are offered a good view. I used a zoom lens (300mm + 1.4xTC) and cropped the photos for a closer view of the chicks. Lovely shots Tammy. I think that adult is saying "don't mess with my babe". Hey, there you are back with what I asked for last time, - the chicks growing up, - fantastic to see Tammy, follow them, we will see how it goes the comming days/weeks ! That heron looks like she needs a holiday... poor darling !! Unas imágenes cargadas de mucha ternura. haha! Love those chicks! Wonderful shots, Tammy! 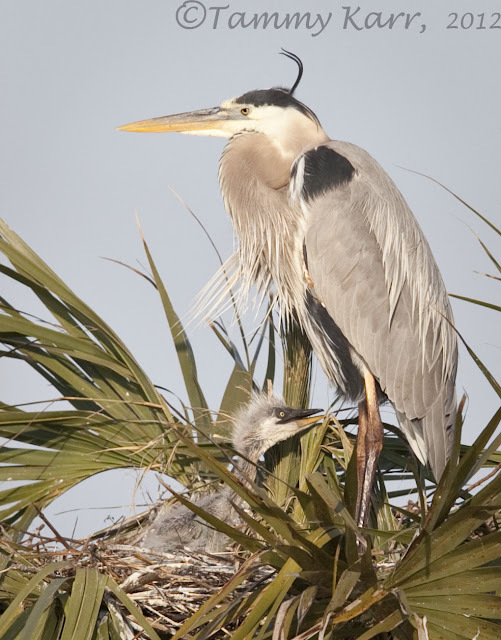 I wish our herons nested in the local area. It`s hard to believe that those less than attractive chicks (sorry, but its true) ;), grow up to be the beautiful adult heron. Nice pictures youve got there on the "Häger" as we say in Sweden. Oh Tammy, these are glorious captures! 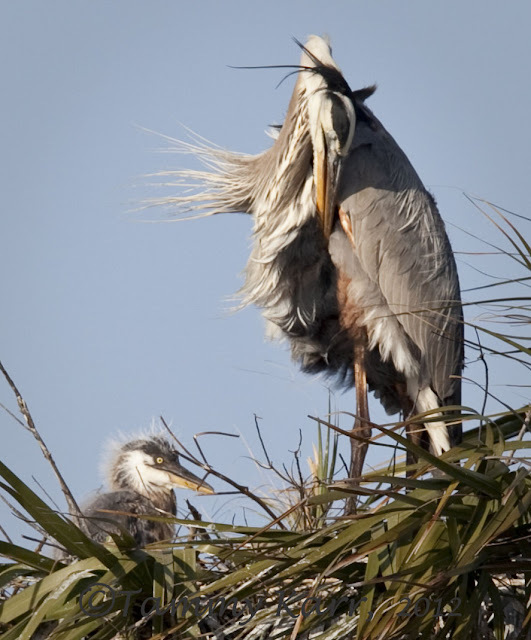 It's always fun to see the scrawny little ones in the nest. I really should make plans to visit my parents down in Florida at this time of year. It would be wonderful to observe the sights that you feature in this outstanding post. Beautiful! ¡Qué imágenes mas bonitas y tiernas! Muchas gracias por compartirlas Tammy.